Draw a line which passes through two of the labelled points, A, B, C, … Select a point where your line crosses an existing line and mark it X. Select a labelled point and mark it Y. 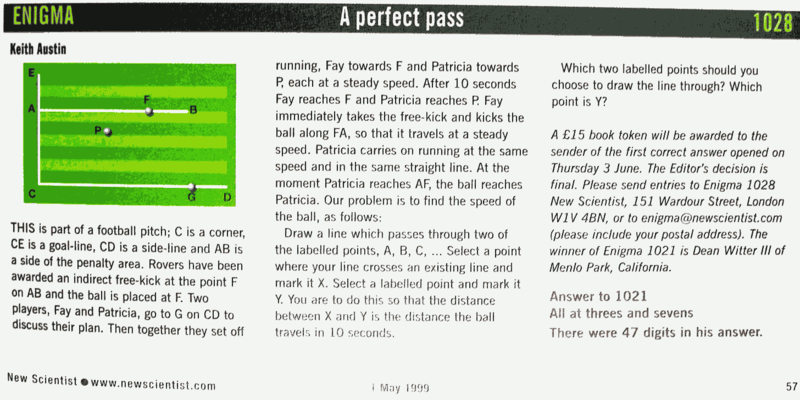 You are to do this so that the distance between X and Y is the distance the ball travels in 10 seconds. Which to labelled points should you choose to draw the line through? Which point is Y? I didn’t write a program to solve this one. First we extend GP to meet AB at point Z, the point where Pat intercepts the pass from Fay (who is at F). We can now extend FP to meet (the extension of) CD at point X. As AB and CD are parallel, the triangles PZF and PGX are similar. GP is the distance travelled by Pat during the 10s before the pass, and PZ is the distance travelled by Pat during the pass. During the pass the ball travels the distance FZ, so the corresponding side of the other triangle, XG, will be the same length as the distance that the ball would travel in 10s. 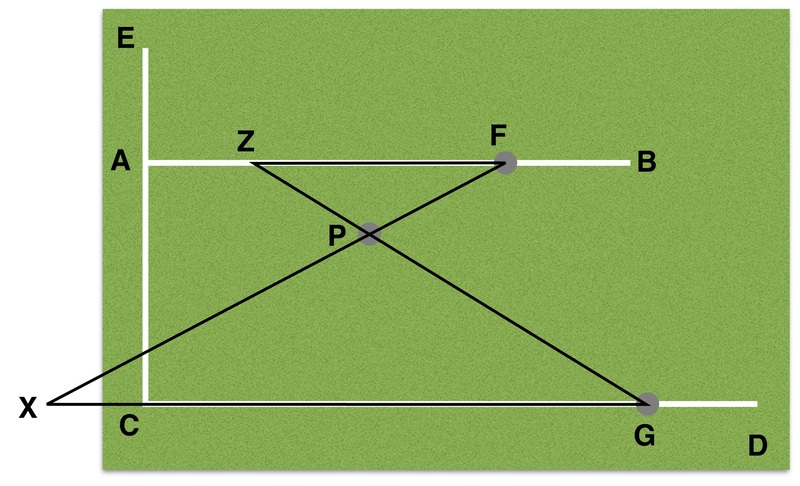 Solution: The line is drawn through F and P. The point labelled Y is G.